Ranked as one of the most innovative companies in the world, IDEO is an innovation and design firm, founded in 1991. Its client list include heavy hitters such as Microsoft, Intel, Nokia, Nestle, and Proctor and Gamble. Harvard Business Review, June 2008, has an article by their CEO and President, Tim Brown. Inspiration—the problem or opportunity that is driving the creative design process. How you can be a design thinker? A people first approach—based on keen observation and noticing things that others do not, you can use insights to inspire innovative ideas that meet explicit and implicit needs. This is similar to a user-centric enterprise architecture approach, where we drive business process improvement and the introduction of new technologies based on genuine user/business requirements and a strategic understanding of the performance, business, information, systems, technologies, security, and human capital aspects of the organization. Integration—To develop innovative solutions, you need to integrate “sometimes contradictory-aspects of a confounding problem and create novel solutions that go beyond and dramatically improve on existing alternatives.” Integration is an important aspect of EA, not only in terms of enterprise architecture synthesizing business and technology to enable creative architecture plans that drive the organization into the future, but also in terms of breaking down structural and process silos and building a more holistic, synergistic, interoperable, and capable organization. Experimentation—there are “endless rounds of trial and error—the ‘99% perspiration’ in [Thomas] Edison’s famous definition of genius.” Most great ideas don’t “pop up fully formed out of brilliant minds”—“they are not a sudden breakthrough nor the lightening strike of genius,” but rather, they are “the result of hard work segmented by creative human-centered discovery process and followed by iterative cycles of prototyping, testing, and refinement.” While enterprise architecture is not generally-speaking a disciple based in experimentation, part of the EA planning should focus on market and competitive research, including best practices identification and sponsorship that will be used to drive modernization and transformation of the enterprise. Additionally, the EA should include research and development efforts in the plans to acknowledge the ongoing innovation required for the organization to grow, mature, and compete. Collaboration—“the increasing complexity of products, services, and experiences has replaced the myth of the lone creative genius with the reality of enthusiastic interdisciplinary collaborator.” As an enterprise architect, I am an ardent proponent of this principle. In the large and complex modern-day organization of the 21st century, we need both breadth and depth of subject matter experts to build the EA, govern it, mange change, and drive modernization in our enterprises. As any half-decent architect knows, ivory tower planning effort are bound for failure. We must work collaboratively with the business and technology experts and give all our stakeholders a voice at the table—this give change and innovation the best chance of real success. For enterprise architecture to be successful, it is not enough to be functional (i.e. to set a good plan), but rather it has to have design thinking and be useful and usable to our end-users (i.e. User-centric). By incorporating innovative thinking into not only the EA plans, but also into how we reach out and collaborate with our stakeholders to build the plans (i.e by sparking the innovative process and creative juices with constructive challenging of the status quo to a broad array of subject matter experts), and the way we employ design to portray and communicate these plans (i.e with profiles, models, and inventories for example), we will have a architecture that truly represents the organization, is understood by it, and serves its needs and aspirations. Should the U.S. federal government have a Chief Information Officer (CIO) and/or a Chief Technology Officer? For the purpose of this blog, I will use the terms synonymously. 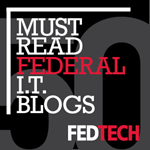 In the federal government today, we do not actually have a federal CIO or CTO. The closest thing we do have to it is the Administrator for the Office of E-Government and Information Technology in the Office of Management and Budget (OMB). Within that office, we also have a chief architect. MIT Technology Review, September/October 2008 has an interview by Kate Greene with Mitch Kapor, the founder of Lotus, founding chair of Mozilla, and a board member of Linden Research who advocates for a federal CTO. What are some policies the federal CTO would champion? And of course, overall enterprise architecture planning and IT governance. As we enter the last few months before the presidential election of 2008, perhaps it is a good time to think not only about the next Commander In Chief, but also about the leadership role(s) of tomorrow—such as a federal CIO/CTO—that will be necessary for maintaining and solidifying our nation’s technological superiority for now and the future. With SOA, business activities can be accessed via the Internet through web services. Rather than build proprietary, redundant business services, our organizations can re-use standardized services, developed internally or outsourced, as components that plug and play into our enterprise. How does this differ from other quality improvement initiatives? Prior quality improvement efforts like Total Quality Management (TQM) and Six Sigma have focused on reducing waste and defects and eliminating unnecessary tasks and integrating disparate ones. Now with the Internet and web services, we can access standardized services that can be shared and re-used throughout disparate business units in the same enterprise and across organizations globally. The result is business units and organizations that can simply plug and play to make use of needed services, eliminating proprietary processes and redundant systems and enabling outsourcing of noncore mission functions and activities and easier upgrades to new superior services as they come online. What are some of the issues holding SOA back? Firstly, many people do not truly understand SOA, what it is, what benefits are possible, and what the challenges are to doing it right. Second, SOA is viewed by many executives as yet another hype or bubble that will cost the enterprise lots of money, but fail to provide the promised return. So, they are wading into SOA only enough to “deploy it in a limited fashion,” but without first rethinking the design of their business.” However, to really reap the benefits of SOA, organizations need to transform from “collections of proprietary operations into a collection of standard plug-and-play activities,” and this requires redesigning not only IT systems, but operations. Where are we today with SOA implementation? To overcome the obstacles in reaching SOA enabled organizations, we need a strong dose of enterprise architecture to identify and decompose our performance outcomes we are driving toward, the business processes to achieve these, the information required to perform these, and the systems that can serve them up. Primary (I would call this core mission)—those that should be kept in-house and are “top priority of programs to improve operations and technology” (i.e. through business process improvement, reengineering, and the introduction of new technology). Shared—those that “can be shared with other divisions” (i.e. through common solutions). Shifted—those that “can be transferred to customers, suppliers, or operational specialists” (i.e. outsourced). All but the primary activities are ripe for SOA-based enhancements. And according to HBR, only about 20% of activities are primary, so that leaves plenty of room for a SOA plug-and-play. The idea is to cease defining our noncore mission processes and activities as proprietary, requiring elaborate and expensive customized solutions for these. Instead, we should use standardized “swapped, bought, or sold” services. Then, we can truly focus our business process reengineering and IT investments on our organization’s core mission activities—working to to differentiate ourselves and develop unsurpassed competitive advantage. Setting standards help us to reduce complexity, contain costs, build interoperability, and secure the enterprise. The Air Force is leading the way in setting standard configurations for the Federal government for computers, servers, printers, and cell phones. Now ITCC is working with DISA, NSA, Army, Navy, Marine, and Coast Guard to build Server configurations. Microsoft is taking these base configurations and “will develop configurations for ‘roles placed on top,’ says Michael Harper, Microsoft Service Director. FDCC is “forcing the software industry to pay greater attention to the default settings of its products”. This is helping to reduce security vulnerabilities, and reducing costs. FDCC has been so successful that ITCC is now moving forward with doing the same standardization for mobile devices. FDCC is a step forward in terms of inter-agency collaboration, working with the vendor community, and creating an enterprise architecture that hits the mark for improved IT planning and governance. Burton Group released a report entitled “Establishing and Maintaining Enterprise Architecture Momentum” on 8 August 2008. How can we drive EA? Completely agree: EA should not be a paper or documentation exercise, but must have a true value proposition where EA information products and governance services enable better decision making in the organization. Where did the need for EA come from? Agree. The distributed nature of modern computing has resulted in issues ranging from unnecessary redundancy, to a lack of interoperability, component re-use, standards, information sharing, and data quality. Our computing environments have become overly complex and require a wide range of skill sets to build and maintain, and this has an inherently high and spiraling cost associated with it. Hence, the enterprise architecture imperative to break down the silos, more effectively plan and govern IT with an enterprise perspective, and link resources to results! What are some obstacles to EA implementation? Agree. As long as IT funding is not centralized with the CIO, project managers with pockets of money will be able to go out and buy what they want, when they want, without following the enterprise architecture plans and governance processes. To enforce the EA and governance, we must centralize IT funding under the CIO and work with our procurement officials to ensure that IT procurements that do not have approval of the EA Board, IT Investment Review Board, and CIO are turned back and not allowed to proceed. Disgree with this one. Collecting a solid baseline architecture is absolutely critical to forming a target architecture and transition plan. Remember the saying, “if you don’t know where you are going, then any road will get you there.” Similarly, if you don’t know where you are coming from you can’t lay in a course to get there. For example, try getting directions on Google Maps with only a to and no from location. You can’t do it. Similarly you can’t develop a real target and transition plan without identifying and understanding you current state and capabilities to determine gaps, redundancies, inefficiencies, and opportunities. Yes, the ‘as-is’ state is always changing. The organization is not static. But that does not mean we cannot capture a snapshot in time and build off of this. Just like configuration management, you need to know what you have in order to manage change to it. And the time spent on analysis (unless we’re talking analysis paralysis), is not wasted. It is precisely the analysis and recommendations to improve the business processes and enabling technologies that yield the true benefits of the enterprise architecture. How can we show value? Agree. Business drives technology, rather than doing technology for technology’s sake. In the enterprise architecture, we must understand the performance results we are striving to achieve, the business functions, processes, activities, and tasks to produce to results, and the information required to perform those functions before we can develop technology solutions. Further, the readiness state for change and maturity level of the organization often necessitates that we identify opportunities where change is possible, through genuine business interest, need, and desire to partner to solve business problems. Years ago, we heard the mantra that paper was going to go away and we were entering the age of the paperless society. But this vision has not come fully to fruition. Public CIO Magazine, August/September 2008, reports that “everyone figured the electronic processes were going to wipe out paper, but that never happened. One possible reason is that printers kept getting faster and cheaper.” (Ralph Gammon, editor and publisher of the Document Imaging Report). Paper is plentiful in the public sector as well. “The OMB’s latest report, Information Collection Budget, FY 2007, reports the burden increased from 8.24 billion hours in fiscal ’05 to 9.92 billion hours in ’06, a rise of more than 8 percent.” This amounts to an average of 39 hours in 2006 for the average adult in the U.S. to complete government paperwork. Why is the government not cutting back on paper in lieu of digital solutions when communicating with the public? Over time, as technology continues to permeate our society, the necessity for paper solutions for the masses will decrease. In enterprise planning for electronic document solutions for our organizations, we need to work towards ever more sophisticated solutions for the creation, storage, handling, search and retrieval, retention, and disposition, collaboration, and security of information. These solutions should provide for a feature rich electronic document environment including: document management, version control and workflow, record management, imaging and optical character recognition, and overall content management. Through implementation of electronic document management solutions, we can continue move our enterprises toward enhanced worker productivity, reduced burden on our customers/partners/stakeholders, cost savings, better access to information and hence better decision making capability, and compliance with mandates such as the Paperwork Reduction Act, Government Paperwork Elimination Act, Federal Records Act, and Freedom of Information Act. Is the Seinfeld ad a good branding strategy? In perspective, Seinfeld was already off the air before Vista, Zune, or the iPhone was ever created. Microsoft’s attempt at reversing their “stodgy corporate image” is a feeble attempt that in fact solidifies that very image. It is no wonder that Microsoft is enamored with the 1990’s when they were the king of the hill in corporate America and in the technology arena with the launch of Microsoft Office in 1989 (the same year Seinfeld episode 1 aired) and before Google was founded in 1998 (the last season Seinfeld aired). From an enterprise architecture perspective where is Microsoft going wrong? Microsoft is still living in the past—hence, the choice of the historic Jerry Seinfeld as their new image maker. Rather than acknowledging their current architecture and looking to the future or target architecture and how to transition forward, Microsoft keeps looking in the rearview mirror at where they were 10, 15, 20 years ago. Microsoft keeps trying to catch up to the new generation of innovators like Google and Apple by either trying to acquire the 2nd tier competition like Yahoo or developing copycat products like the Zune. Even if Live Labs succeeds, what are the other 89,875 employees at Microsoft doing? To really compete in the future, Microsoft needs better planning and governance and this is what enterprise architecture can bring them—a forward looking and improved decision making framework. Unfortunately, all too often, the man-machine interface is not dealt with up front. “Traditionally, the machine and the technology are designed first and then the pilot has to deal with what’s left over, usually through training,” says Maris Vikmanis of the Air Force Research Laboratory. Not designing in ergonomics from the get-go is a failure to consider the human capital perspective of enterprise architecture and will result in technology solutions that are sub-optimal to the end users and to the performance of the mission. One example of enhancing man-machine interface is “deciding the best interface for people to use with onscreen data. A regular mouse turns out not to be so good for this; it would be better if someone could actually reach into the data to interact with it, which means devising more tangible interfaces.” (Remember the movie Minority Report…) I do not know if this type of 3-D data interface even has a name yet, but I would call it something like virtual data manipulation (VDM). We’ve got to change from the “build it and they will come” mindset of the failed dot.com era to a more User-centric EA approach that demands that we design IT with the end-user in mind. As Goodard summed up, “there’s been a lack of awareness about the importance of the man-machine interface in the early designs of weapons systems.” It’s certainly time to change that and not only for military and law enforcement systems, but for IT across the board. Based on a number of studies done in the last 10 years (such as The KPMG Canada Study, The Chaos Report and others), it has been established that more than 50% of IT projects fail outright! Why do IT projects fail? More often than not, it’s because managing IT has become a by the seat of the pants proposition—where things get decided by gut, intuition, politics, and subjective management whim. And we know that is not how to manage IT. The way to make order out of IT project chaos is through enterprise architecture and IT governance. EA is how we plan IT, synthesizing business and technology information, and driving business process reengineering, improvement, and the introduction of new technologies. Governance is how we administer structured, consistent, and collaborative decision making, so managing IT is no longer a black box affair. Together EA and IT governance provide for sound IT investment decision making, where EA serves as a strategic information asset to guide and influence capital planning and investment control activities of select-control-evaluate to ensure more successful IT project delivery. Interestingly enough, Federal Times, 4 August 2008, corroborates the true high failure rate of IT projects. The reason though that all the IT projects missing the mark don’t show up on the OMB high-risk list is that “nearly half of the 180 IT projects surveyed by GAO have been rebaselined at least once. Of those, half were rebaselined twice and 11 percent were rebaselined four or more times,” according to David Powner GAO’s director of IT management issues. What exactly does rebaselining mean? “Nearly all of the rebaselined projects altered their cost and schedules because of changes in requirements or funding,” according to Karen Evans, OMB’s IT administrator. So, if your changing the projected IT cost and schedule to match the actual—well then guess what? Naturally, more of your IT projects magically seem to meet their cost and schedule goals, and the true IT project failure rate is obscured. Note that OMB is only looking at cost and schedule overruns and that doesn’t even take into account missing the mark on IT project in terms of performance parameters—one of the most important aspect of IT projects true success. Perhaps, if we focus more on truly investing in better enterprise architecture and IT governance, then organizations wouldn’t need to rebaseline their cost and schedule projections to make for faux IT project success. A very interesting article in ComputerWorld, 7 August 2008, called "Bet on it; Employee wagers help companies predict the future," shows how difficult planning can be and highlights the necessity of bringing stakeholders to the table to get better information (enterprise architecture) and better decisions (IT governance). Other companies like Best Buy, Corning, HP, and Qualcomm are using predictive markets for sales projects, product evaluations, estimating project delivery, and assessing market conditions. While betting is typically associated with greed and vice and people ending up losing their shirts, in predictive markets, employee betting is used in a positive way to capture information from a broad spectrum of people and thus, enable better governance/decision making. Predictive markets are an affirmation of the need to bring people in the planning and decision making process. Information needs to be captured from across the enterprise , for example, using predictive markets or other collection techniques. The more information served up in a user-centric way, the better the decisions. Information availability and communication mobility is all the craze. We are connected everywhere we go. We have our phones, PDAs, and laptops as part of our everyday gear. We wouldn’t leave the house without one or more of them or a converged device like the iPhone or Sidekick. And people are walking and driving around yapping on the phone or typing out text messages. Evan at work, people are answering the phone and texting in the stall. What is it about being connected with these devices that we literally can’t let go? The stories go on and on about texters who bump into brides at wedding, fall off of curb and into construction barricades, walk into two-by-fours toted by construction workers, knock into bikers, and fall down staircases. As a student of organizational behavior and an enterprise architect, I ask myself what is going on that people feel such a compelling need to be in touch literally every second. Are people craving intimacy? Are they insecure? Do they get a high by connecting with others and just can’t stop? Is this good thing for society and our organizations? Certainly, the ability to communicate anytime, anywhere is a good thing. It makes us more capable. It can make us more productive (if we don’t end up killing ourselves in stupid accidents doing it irresponsibly). But like all good things, we need to learn to control our appetite for them. It’s the difference between eating thoughtfully or eating thoughtless, like glutton. Or between taking medicine when needed to treat a legitimate medical condition or just using recklessly like an addict. Part of good enterprise architecture is building balance into the organization. Architects introduce new technologies to enable performance, but should also help develop policies and ensure training for responsible usage. It’s terrific to bring new capabilities to the organization and society, but our role as architects does not end there. The human capital perspective of the enterprise architecture comes into play and demands that we go beyond the pure business requirements and technology solutions, and explore the impact of the technology on the people who will use. The human capital perspective of the architecture provides a lens through which we can manage the integration of people and technology. I’d believe that we should educate people to use technology more responsibly, rather than outfit every lamppost and tree with bumper pads! When people work from home, should their employers simply set performance goals for them and then evaluate them based on whether or not they met these or should employers monitor employees work at home to ensure that employers are where they say they are and doing what they say there are doing? Home-based workers have been increasing steadily over the years, with over 16 million home-based workers now in the U.S. That is huge! Is this big brother watching mentality too invasive or is it appropriate when we’re on the clock? From an enterprise architecture perspective, I believe it’s important to consider not only the performance aspect to the organization in terms of productivity and cost-effectiveness of these workers, but also to look at from a human-capital perspective with respect to treating the employees with trust, respect, and integrity. I believe that people should be given the benefit of the doubt and treated kindly and humanly and not subjected to undue and invasive monitoring like photographing them on a webcam. Instead, let’s set ambitious, but realistic performance goals for our employees. Most the time, work at home employees end up exceeding performance expectations. For those that don’t meet their goals, then additional monitoring is appropriate to further assess their performance and to decide whether the privilege of working at home should be continued or not. Trust but verify. Let’s start off with a core dose of trust, but have the verify ready to go for those that abuse it. Enterprise architecture can plan, but it must also perform outreach to meet stakeholder requirements and get their buy-in and commitment. A plan without acceptance is shelf-ware. National Defense Magazine, March 2008, reports on Robot Soldiers, where the technology now exists to make them autonomous and carry lethal weapons—a deadly combination—but the military is not ready to accept it (yet). Additionally, robots can now carry lethal weapons, including guns and rocket launchers or non-lethal weapons such as pepper-ball guns, and they have various sensors “to help them navigate rooms and avoid obstacles,” and track friendly forces. They can protect themselves against tampering, conduct explosive ordnance disposal (such as in Iraq), patrol installations, and bring the fight to the enemy. The robot soldier can accompany a real-life soldier—it can follow and keep pace—and when the soldier picks up a weapon and points it at something, so does the robot. A handy companion indeed when you’re about to get into a firefight! Yet, despite how capable these robot soldiers are, barriers to acceptance remain. Outfitting an autonomous robot with a lethal weapon to use against humans is a big step and one that many in the military establishment are not ready to accept. But is it just a matter of time, especially if our enemies are developing these capabilities too? It’s interesting that technology can get ahead of our ability to accept it, integrate into our norms, cultures, and way of life. An enterprise architect’s job is not just to identify and introduce new technologies (and business process improvements) to the organization, but to actually help manage the change process and adapt the new technologies to meet the mission. In the case of robot soldiers, the acceptance and culture change will need to be met with many safety precautions to ensure that even robots functioning autonomously can be managed safely.